Synthetic peptide corresponding to KAT13C/ NCOA2. Nuclear or cytosolic extract from HeLa cells. 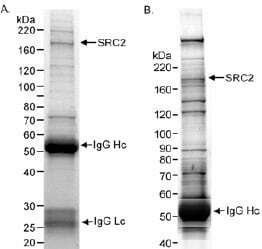 Antibodies were affinity purified using the peptide immobilized on solid support. Our Abpromise guarantee covers the use of ab10508 in the following tested applications. IP Use at 1-4 µg/mg of lysate. WB 1/1000 - 1/10000. Predicted molecular weight: 159 kDa. Transcriptional coactivator for steroid receptors and nuclear receptors. Coactivator of the steroid binding domain (AF-2) but not of the modulating N-terminal domain (AF-1). Required with NCOA1 to control energy balance between white and brown adipose tissues. Note=Chromosomal aberrations involving NCOA2 may be a cause of acute myeloid leukemias. Inversion inv(8)(p11;q13) generates the KAT6A-NCOA2 oncogene, which consists of the N-terminal part of KAT6A and the C-terminal part of NCOA2/TIF2. KAT6A-NCOA2 binds to CREBBP and disrupts its function in transcription activation. Contains four Leu-Xaa-Xaa-Leu-Leu (LXXLL) motifs. The LXXLL motifs are essential for the association with nuclear receptors and are, at least in part, functionally redundant. The LLXXLXXXL motif is involved in transcriptional coactivation and CREBBP/CBP binding. Contains 2 C-terminal transcription activation domains (AD1 and AD2) that can function independently. 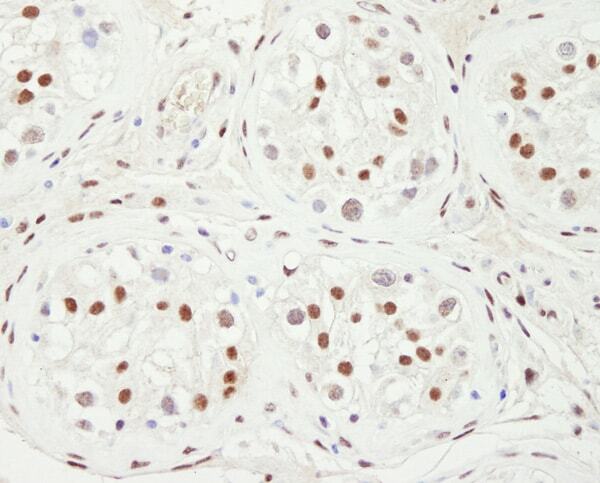 Immunohistochemistry (Formalin/PFA-fixed paraffin-embedded sections) analysis of human testicular seminoma tissue labelling KAT13C / NCOA2 with ab10508 at 1/1000 (1µg/ml). Detection: DAB. Publishing research using ab10508? Please let us know so that we can cite the reference in this datasheet. There are currently no Customer reviews or Questions for ab10508.